The lovely Michelle has chosen 'Night Time' as the theme at The Stamp Man this week and this really challenged my thinking and creativity. I thought I would do some brayering, but when it came to putting ink on the card I decided to blend it instead. I masked off the sky and moon, blended DIs and then dried it ready to mask off layers for the ground, again blending DIs. I stamped the birds and trees with archival black, sprinkled water over and dabbed it off to get a snowy effect and then splattered some white acrylic paint and water over the top of that. I am quite pleased with the effects. I then made the tree similar to TH tags of Christmas 2010 and added the ticket and button. DIs - peeled paint, pine needles, forest mnoss, walnut stain, antique linen, dried marigold, tumbled glass, stormy sky, chipped sapphire. I hope you will pop over to the Stamp Man blog to see all the other wonderful creations from the team and hopefully you will be inspired to have a go too. Jill will have a £10.00 voucher ready and waiting for the winner as chosen by the design team. I was really excited to see that I have been chosen as a Ginger Gem again for my 'Shared Moments' card at Gingersnap Creations - such a prestigious award and thanks Shar and girls for choosing me. Thanks to you all for taking a peek at what I have posted today. If you leave me a message and a link I will be able to pop over to see what you have been creating too. ABC Christmas Challenge - U is for unused stash - the tree die and antelope button, both left over from last year. Fab n Funky - Distressed or torn. My time to Craft - Punches and dies. Sweet Stamps - Lots of layers. Try it on Tuesday - Taking to the skies. Ooh La La Creations - Let It Snow. This is beautiful, Brenda! Always nice to try something different, and the blended DI's made a wonderful night sky. Take care and have a great day. Brenda, the "Night Time" scene you created is so lovely that you did not even need any embellishments! Beautiful blending and design! Have a great weekend! 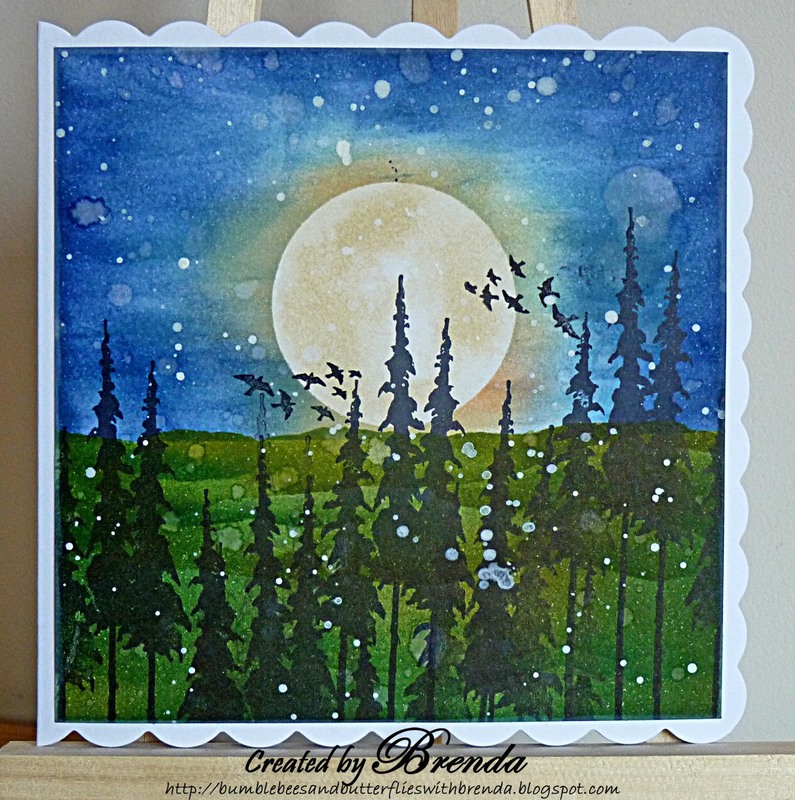 A beautiful night scene Brenda - absolutely love the sky and the techniques you have used. Wow Brenda. With or without embellishments this is just gorgeous!. Wowzer Brenda, this is gorgeous!! Love how you've created the snow effect - it looks awesome! and the moon is so realistic. Gorgeous textures and love the tree!! Hope you are keeping well and hope you have a great weekend! I thought it looked pretty good till I saw how you dressed it WOW ! wow ~ what a STUNNING background...and so beautiful with the added embellies! great take on the challenge this week! Wow, that's a wonderful card. It looks without embellishment fantastic, too. I saw this when I went on the SM site to post my entry. Stunning!! I must admit I went back in again to see it. Great work!! Fabulous card, love the night-time scene you have achieved. Wow Brenda! What a stunning card. Your scene looks amazing and the snowy effect is fabulous. It really does look like a winter evening. This is just gorgeous!!! The whole scene you have created is just amazing!!! fabulous work! 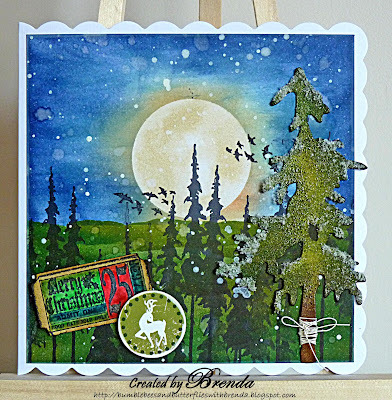 Wow Brenda I saw this is the DT line up on the challenge blog and it caught my eye, it looks like a water colour painting, it is brilliant, the techniques you have used look awesome, I love it. This is really lovely Brenda - very striking. Thanks so much for your comments on my blog too. Brenda, this is awesome, the shading on the moon makes it look so real, absolutely brilliant. See you on Wednesday, really looking forward to it. Have a good Saturday. Thank you Benda for popping over to my cyberspace and leaving a comment... much appreciated. Love the snow effect on the card.. en the detail in the second card... the little string around the tree. It is so much fun to see all the various creations of the team. Wishing you a creative weekend. Thank you for joining us at Sweet Stamps. Gorgeous card with all the embellishments. Hi Brenda thank you for your kind words ! What a beauty this is should be in a frame. Such beautiful techniques and colours here and you have created a fabulous scene for us.